My hubby and I are coffee lovers...but he likes his hot and I like mine cold. (See, opposites really do attract!) My favorite iced coffee in the whole wide world is from Dunkin' Donuts...blueberry iced coffee with no sugar and extra cream. It is divine!! BUT, I gotta tell you, this homemade version is a very close second! For years I've made my iced coffee by brewing a cup at night and then sticking it in the fridge until the next morning. I've even tried the Pioneer Woman method with the concentrated coffee syrup and while it was okay, it took up valuable refrigerator space. The great thing about this recipe is that I can have it whenever I want to. You know, like in the afternoon when all the kids are having quiet time or taking nap and I get to have a few minutes to chill! Fabulous!! Take a jar ( I love drinking out of mason jars!) and fill it with 1/2 cup of water and add 2-3 tsp. of instant coffee. I like my coffee strong, so you might want to start with less. You wanna know what my hubby says? "There is no such thing as strong coffee, just weak people." Cracks me up! And there you have it, a delicious Iced Coffee in about two minutes! But then again, don't try to make it too pretty because it's just gonna look like this in about 30 seconds, lol! So next time you REALLY want iced coffee, just whip one up yourself for a fraction of the cost of buying one. It's quick, cheap and most important, delicious! Are you an iced coffee lover like me or do you like it hot? Have you ever tried making your own iced coffee? Oh my stars..delicious! Can't wait to try it!! Thanks! Looks yummy! I will be making these this summer! o goodness, I love coffee when there's creamer. hot, iced, blended...I love it all! this looks fabulous! I usually make a special drink when the kids go down too - either coffee, tea, hot choc, or choc milk. YUM!!! I like both...depends on the weather. I'm ready to move into iced coffee mode, but I've just been buying it out because I didn't know it could be done at home so easily! Thanks for sharing! That looks great! I usually just pour some freshly made coffee in a bowl and stick it in the freezer while I gather the rest of the makin's. By that time, and especially with the ice and other cold ingredients, it's cooled enough. I'm more of a blended coffee girl for a treat or in the summer, but since our weather is usually coldish, my usual daily homemade coffee treat is hot... Or I call mine "coffee-flavored-soy-milk," because it's more milk and flavoring than coffee. I don't know why I never thought to use instant coffee for iced coffee. I'm going to have to try this. Yummy! yummy!! I would love to try something like this for my kids. YUM! 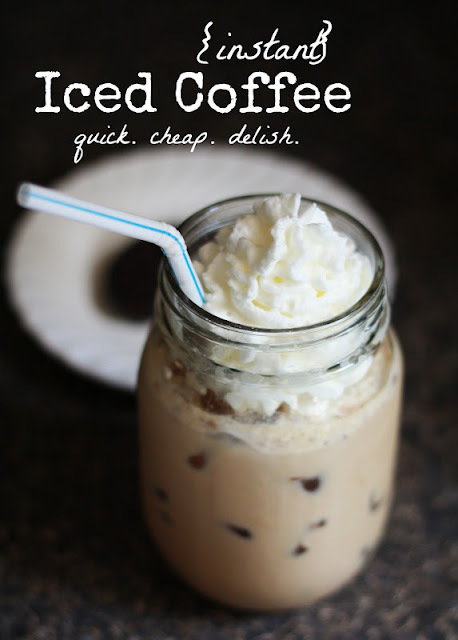 I've recently gotten into drinking iced capps....have to work my way in slowly to the coffee idea...but this looks so yummy! So funny, I just thought of this yesterday and made some today. I used Folgers (my hubby's coffee) and it was god awful. I'm going to have to go to Whole Foods and get the fancy stuff, then I'm sure it will be good. I'm going to try your recipe cause it looks really yummy and I love the idea of using mason jars. That looks amAzing! Love that you included the photo of pouring the milk outside the jar. That's just the kind of thing that makes me feel a little more comfortable and not as ridiculously klutzy as I sometimes am. Hehe. Thanks for sharing this yumminess. Yummy, I have not tried iced coffee yet, nope not even at Starbucks, but I may try this! I usually drink my coffee hot but this looks delish! Half and Half and whipped cream. There couldn't be anything wrong with that. I am going to try this. Looks devine. I am an iced coffee person myself something about hot drinks is just not for me. I usually just brew at night and put in the fridge but can't wait to try this. Thanks for sharing. REALLY?? I like iced coffee. . . but it's always seemed like more trouble than it was worth. THIS looks like it would be worth trying!! I drink real coffee in the morning. After noon, though, I'm a decaf person. My husband sticks with decaf altogether. I like some caffeine, but it is a drug. . . and all drugs have side effects. Heart palpitations? Not good! Thank you so much for joining Grace at Home! I'm frugal. Not cheap, you'll notice--frugal. And I refuse to go out and pay what iced coffee, etc. costs unless I'm meeting a friend or I'm out already and dying for some. Made iced coffee since I was a teen, usually using instant cause my mom did. And it can be very good, I agree 10,000% You don't do caffeine well, I don't do milk well. I put vanilla soy milk in my coffee & cereal. If you get Very Vanilla Silk it's as rich as International Coffee vanilla non-dairy. Now I want some and it is too late for me to do caffeine and we have no decaf :-(. You have a new subscriber; I came from Imparting Grace. I had to go to Aldi the next day after reading this and HAD to get some of the decaf to try this and it was FABULOUS!!!! LOVE IT!!!! I had made a batch of the cold brew coffee, but it takes so much coffee grounds and it was hard for me to justify spending that much....although, I could rationalize that a whole batch was cheaper than one iced coffee out. This tastes great and can make when I want and not have to strain the grounds out of my coffee! So glad you shared this.....I come from a family of black coffee drinkers and instant was against the law, so had never tried it or considered trying it. Thanks so much for sharing and inspiring!! :) I found you from the link party at Raising 4 Princesses. WHERE did you get those yummy icecubes??? Picture #10 looks like there's a tiny little chocolate covered donut in there. mmmmm - I just love this idea - I use those little Starbuck's packets, so after reading this, I was like WHY DIDN'T I THINK OF THAT. you, my dear are brilliant! Thanks! If you add some sweetened condensed milk to that you will be in HEAVEN! I think I'm going to regret finding this! I love hot coffee in the winter but a cold coffee by the pool is my total favorite!